Written exclusively with computer science students in mind, Discrete Mathematics for Computer Science provides a comprehensive treatment of standard course topics for the introductory discrete mathematics course with a strong emphasis on the relationship between the concepts and their application to computer science. The book has been crafted to enhance teaching and learning ease and includes a wide selection of exercises, detailed exploration problems, examples and problems inspired by wide-ranging applications of computer science and handy quick reference guides for key technical topics throughout. 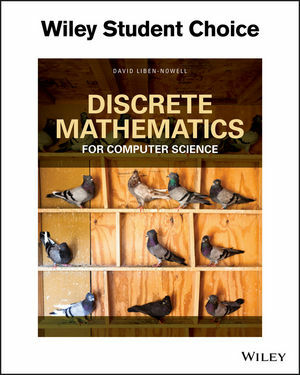 Discrete Mathematics for Computer Science  provides a lucidly written introduction to discrete mathematics with abundant support for learning, including over 450 examples, thorough chapter summaries, simple quizzes, and approximately 1600 homework exercises of widely varying difficulty. Each chapter  begins with motivational content that relates the chapter topic to computer science practice and the book also includes over fifty "Computer Science Connections" which discuss applications to computer science such as Rotation Matrices; Game Trees, Logic, and Winning Tic-Tac(-Toe); Moore's Law; Secret Sharing; The Enigma Machine and the First Computer; Bayesian Modeling and Spam Filtering; and Quantum Computing. David Liben-Nowell (PhD from MIT) is a Professor and Chair of Computer Science at Carleton College. His research interests are focused on computational social sciences, particularly the structure and evolution of social networks and computational modeling of spoken-word recognition.